Thanks for the heads up from zzztimbo on Twitter, who linked to this story at TechCrunch. The first useful application of push notifications in an iPhone app hit the store today, as AIM with push is now live. I haven’t messed with it much, but I think a lot of people have been waiting for this. Hit the update link in the App Store to grab it, or click here to install it for the first time [iTunes link]. 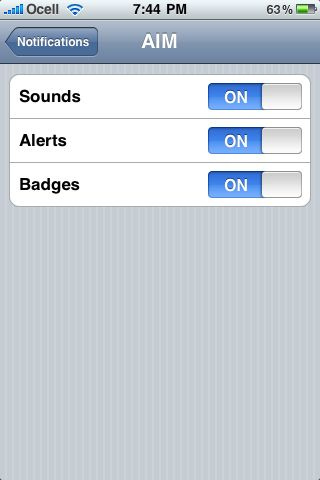 I’m especially happy to see that the notification sound can be disabled. 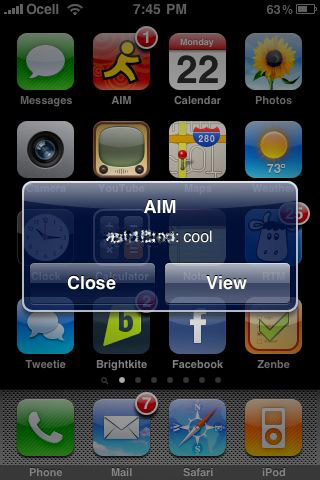 I hate that patented AIM Soundâ„¢.